A long-running Irish blog with reviews of the best restaurants in Dublin and throughout Ireland. Some wine and cocktails thrown in for good measure! Well, it was my 30th birthday recently. To be honest, I didn't feel anything special in the run up to it, nor have I felt anything different since. But I did book tickets to see Nick Cave & the Bad Seeds perform in his home town of Brighton on my weekend birthday. So off we went to Brighton. It turns out that Gatwick Airport is approximately only 30 minutes from Brighton by train, so that was a no-brainer. Trains are plentiful and frequent. We arrived on one of the coldest mornings of the year so far, with the remainder of a storm blowing over the town. We walked straight down Queens Road to the beach and walked on the storm-tossed beach for quite a while. I love being out in the open and the weather did not disappoint. I had fun taking photos with my camera, and although the light conditions were not ideal and I think that I had the ISO setting too high, I still got some great stormy shots. Later, some bleak winter sunshine broke through the clouds, and the atmosphere began to change. The sea was still stormy, but it was clear that calmness was on the way. I quite like the following shot and think it's one of my best so far. We turned away from the beach and went in search of food. After a wander through the Lanes, we found lovely Crepes & Co which makes savoury buckwheat crepes and omelettes to order. It fortified us to face the cold outside and we went to check in at our hotel. We booked a seaview double room in the Queens Hotel Brighton which, although holding a 3 star rating, has recently been redecorated. It's located just a stone's throw from the Brighton Pier and the luxury shopping area of the Lanes. The room turned out to be fantastically spacious and was warmed by the winter afternoon sun streaming in through the bay window. The rooms are decorated in a clean modern fashion while retaining some of the period features. It's still a 3 star hotel, but represents excellent value for its class. Our room cost £65 for the Sunday night. Our room featured a great view of the famous Brighton Pier, so off we went to walk along the Pier. It is the most amazing structure. It's rickety and tacky and yet gloriously historic. However, there is a real sense of impending doom around the structure as you realise how much it is hanging on in there. As it was Sunday, and we were in England, home of the Sunday Roast, we went in search of a pub with a good roast. Our wandering left us up past the Royal Pavillion, which is the most bizarre structure. 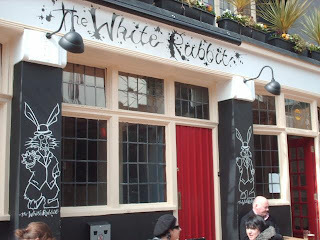 After rejecting several options, we chose the quirky and funky White Rabbit in Kensington Gardens for our late lunch. We had two plates of roast lamb with roast potates, savoy and red cabbage, carrots, cauliflower and Yorkshire puddings for the price of £7.95 per plate. Later, we enjoyed some fresh fudge courtesy of Roly's Fudge, before deciding to take a rest before the concert, which was taking place at the Brighton Centre. I'll leave the concert for another blog session, but I want to make one final mention for the Thai restaurant where we had lunch before leaving Brighton on the Monday. We headed back to the funky area around Kensington Gardens and found ourselves in the Krua Anne Thai restaurant for lunch. Our waitress was simply the most charming woman I've ever met, and the food wasn't half bad either. In fact, it was downright great and was a great finish to our trip to charming Brighton. In summary, I loved Brighton. It's a cool, quirky town, with plenty to offer everyone. We've already decided that we're taking a return trip early next year, so that we can check it out further. I think this place is awesome for the holidays. I can say the atmosphere is very amazing and enjoyable. I love this place. It's a cool, quirky town, with plenty to offer everyone. © Stitch and Bear | All rights reserved.